6.80 points at 15 votes (rank 402). Gamebase64 7 4/5 "Quite Good"
"Go to the Marines!" they said. "There is a lot to explore!" they said...GLUGG! 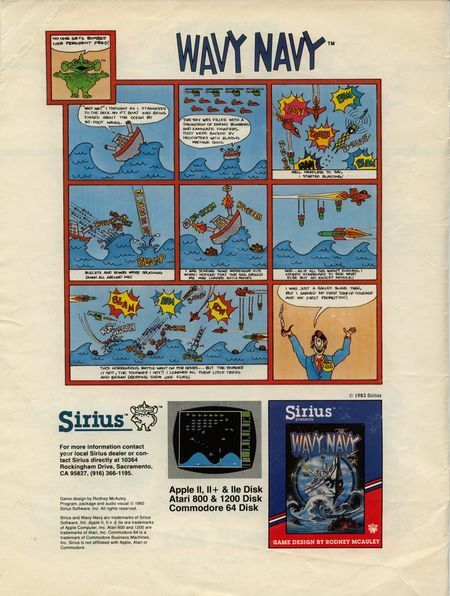 Wavy Navy is a shooter by Sirius Software from 1983. 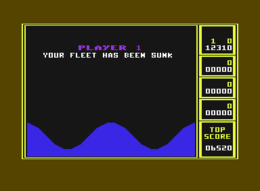 The player takes over the role of the overstrained gunner onboard of the patrol boat "USS Sirius", which has to struggle with a hostile formation consisting of insane kamikazes and even more insane combat helicopters in each level. An additional threat are mines, bombers and missiles, as well as towering waves in comic style, on which the own ship constantly moves up and down and thus aggravate the aiming and avoiding heavily. 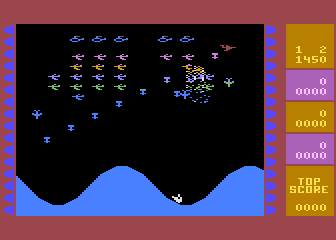 The game reminds of an expanded version of the arcade classic "Galaxians", though played from a rollercoaster. You start with three screen lives and after each survived level you get another bonus life as well as a new rank, which can reach from the lowest galley slave to the born-and-bred president (yes, that is America!). "Why me?" I thought as I staggered to the deck. My P.T. boat was being tossed about the ocean by 30-foot waves. The sky was filled with a squadron of enemy bombers and kamikaze fighters. They were backed by helicopters with blazing machine guns. Well, needless to say, I started blasting! Bullets and bombs were splashing down all around me! I was scoring some impressive hits when I noticed that the sea around me was loaded with mines. And... as if this wasn't enough, I looked starboard to see what else but an exocet missile! My heart was racing as I tried to find a way out of this mess. 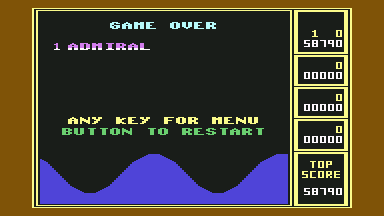 I instantly pushed the joystick hard to starboard while I went on hammering on the fire button. "Ha-ha, missed! Phew...that was close!" I took a deep breath and wiped the sweat from my forehead. 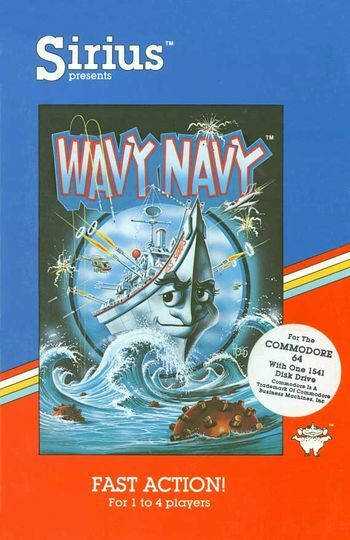 "Wow, sometimes it is hard to believe that Wavy Navy is only a computer game..."
Wavy Navy uses the multicolour bitmap mode to display all objects, which has also been defined very barely. 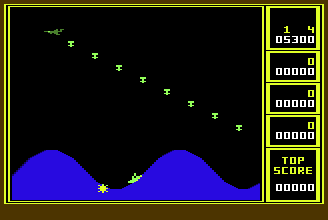 Only the firework-like explosions of the enemies might please the eye of the player for a short time. The consequence of using the bitmap mode is, that the speed of the game is easily slowed down to an unpleasant speed as soon as the happenings in the game increase in hectic and by this at the worst are shown quasi in slow motion. 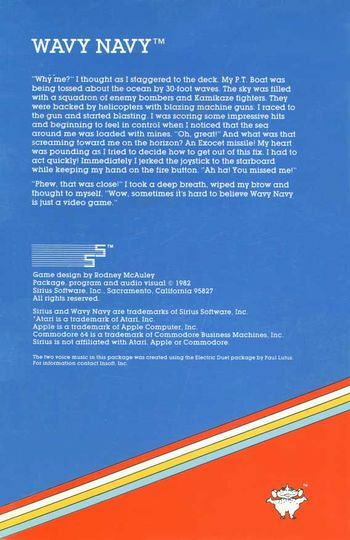 As "Bullet-Time" had not yet been invented in 1983, this needs to be seen as a technical deficiency of the game and again a nasty foreboding creeps in that, as yet so often, a direct, unoptimized portation of a game was made here, which originally had been designed for a system that is rather inept for action games. At least there is much more to the sound: after each level there is a short melody with more or less maritime background, as e.g. "Row, row, row your boat", "What shall we do with the drunken sailor?" or the title melody of Popeye. These small musical intermezzos have been realized charmingly and give the game a touch of humor. Also, the nee-naw of the missile, the sad peep of the own ship when drowning and the silly game over tune underline this impression. The rest of the effects consist of shooting sounds "off-the-shelf". Although the game was only available on disk, they forgot to insert a saveable highscore list. After every level you get 50 bonus points for each ship left as well as a bonus ship. The calculation of the bonus can be quickened by pressing the fire button. The ordinary mine (lat. : Bombus aquaticus vulgaris) is a rather passive kind, for which it is enough to limit the player's room of action in critical situations. You cannot shoot these drifting devices of hell and unfortunately there are also no duds of them in this game. So you have to "put up a brave front" and accept, that you should as much ship around them as possible. A rather astonishing type of fighter jet, which does not stand motionlessly in the air, but is also able to dive into the water after a swoop and come back to the game at the upper rim of the screen without any harm. These engineering marvels form the majority of the hostile fleet and in the early levels do not pose too big a threat thanks to big passiveness (probably no chocolate on board). For shooting one you get 10 points while they are in the formation and 20 while making an attack. They are the true evil guys of the game, which can well and truly heat up the player with extensively scattering machine gun fusillades. However, they can open fire, when they are shortly over the crest of wave in attack position. Then they release short bursts in short intervals and start to shoot closer on the player, if he does not anticipate them in the short reloading pause. If several helicopters attack, one can precautionarily get out the life jacket. There are 20 points for shooting an idle and 50 points for an attacking helicopter. This enemy also gets on your bad side very fast, as he lets down a hail of explosive bullets onto the ship of the player while flying through the screen, which you can hardly avoid, especially if fighters or helicopters are around at the same time. It first appears in the third level and then again in the sixth and should be erased as early as possible with a well-aimed shot, which is worth 100 points. With a nee-naw the Exocet missile is so kind to announce itself and first flies a surveillance round in the upper part of the screen, before it sweeps by a hair's breadth over the crest of waves, this time in the opposite direction. As the contact with this missile has rather unpleasant consequences, you should search for cover in a wave hollow in time, as far as this is even possible with all this swells. The missile appears from level 4 and destroying it is rewarded with 100 points. The highest achievable rank depends on the difficulty level: Beginner = Admiral, Advanced = Minister of Defence, Expert = President. Reaching the highest rank is not combined with any further rewards, except that you can probably make a show of it very well on retro meetings. Of course, the helicopters need to be eliminated first or else you will be in great trouble fast in the later levels. To escape a machine gun fusillade you can sometimes hide behind a wave. If you have been sunk by a helicopter, the same helicopter will try to repeat this with your next life. In levels, in which the missile takes part, you need to take care, that you get not pushed to the rim of the screen and with this up onto a crest in the most inappropriate moment. As the collision query is very imprecise, bomber and missiles are best shot by a hit on the "tip of the nose". The POKE 10935,189 named on some cheat pages produced only spectacular graphic bugs when testing the version from GB64.com. But the recommended 2014 version by Lightside offers trainer modes. Robotron2084: "Wavy Navy is a comical shooter with technical faults, which become noticeable by the imprecise collision query and occasional bad slow-downs in the later levels. Usually, the game stays reasonably fluent and can make points with tumultuous action, in which one can barely handle all the bombs, helicopters and kamikaze fighters. Here every now and then unbelievably close, almost funny situations arise, in which one by a hair's breadth narrowly misses losing a life. I also like the cheerful melodies after each level. If the game had been programmed a bit more effectively to avoid these untold slowdowns, we would have in my opinion a real classic here. 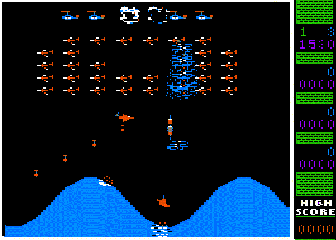 That fast games with many animated objects at the same time were already possible in 1983, can be seen very well e.g. in Shamus. So what, I quite like Wavy Navy also the way it is and I give 6 out of 10 points." TheRyk: "At first sight, an impressively interesting variant of Galaxy, Wavy navy unfortunately shows some flaws in the long run. When the game speed slows down almost to a halt at a certain status, you cannot even adapt to the bugs in the collision query anymore. For thick-skinned shooter friends, this early Space Invaders clone might however be worth a game every now and then, I rate it 6 points with some bonus considering the age." The 2014 version by Lightside offers a saveable highscorelist, trainers and the digitalized cover image as a title picture. 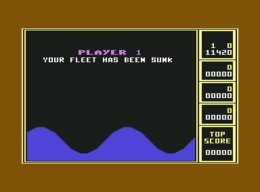 The cover image for Wavy Navy was designed by the American illustrator Scott Ross, who amongst others also designed the covers for Miner 2049'er, The Heist and Snokie. The player fights until he reaches the rank of president in this longplay. The textbook career of president "Fred": from galley slave to president... no problem at all, if you really want it! This page was last modified on 18 January 2019, at 00:18.